Whether in a welding degree program or on the shop floor, wearing personal protective equipment can help keep you safe. Following are some guidelines for women when selecting welding gear. Gloves: Women need protective gloves, and ones made for men may be too large to fit adequately. Gloves should fit a woman’s fingers and palms and be fire resistant to allow for mobility and protection. Clothing: Protective clothing designed with men in mind may be too large for women. Cuffing the pants or rolling up the sleeves to fit a woman can be dangerous because the extra material can become caught in equipment. Hot sparks or smoldering metal fragments could also become trapped in folded articles of clothing. Boots: Most boots designed for the skilled trades industry like welding are made for the average-sized man. Dropping heavy objects on the feet could also be more dangerous because the steel cap of men’s boots may not adequately protect women’s feet. 3 Be sure to buy the right size boots, and don’t hesitate to exchange them for a better size if they end up not fitting properly. Women accounted for 4.2 percent of welders in 2015, which is a small percentage, and the industry is slowly trying to reach out to women. Already, women are proving that they can excel in the welding industry. Having PPE that is made for their bodies should not have to be an issue. Shops and manufacturers are beginning to understand that. 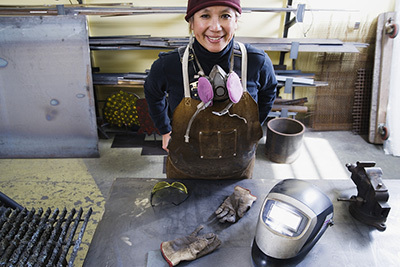 Having gear that fits properly will ensure the safety for women welders. As older welders continue to retire, the industry will need skilled men and women to fill those positions. If a career in welding interests you, contact Tulsa Welding School today to learn more about various welding training programs. The school has been preparing men and women for successful welding careers for over 65 years.